Hurricane Katrina ripped through Mississippi and Louisiana 10 years ago on Aug. 29. The storm killed more than 1,800 people and displaced many more. 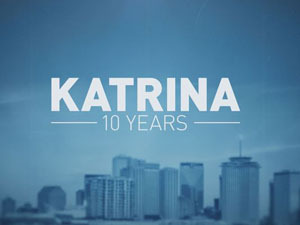 Today, communities remember the damage Hurricane Katrina caused and try to continue healing from their losses. NAFEO). Students who paid tuition to schools that closed as a result of Hurricane Katrina were able to enroll tuition-free for the fall semester at Hampton University. Other colleges and universities across the nation also made accommodations for Dillard and Xavier students to continue their education. "In the aftermath of Hurricane Katrina, Hampton University is poised to offer any assistance necessary to the faculty, staff and students at our sister schools," said William R. Harvey, Hampton University president and chairman of the board of NAFEO. Hampton University accepted over 40 students from schools closed due to Hurricane Katrina. Trevon Swain was among those students. Two weeks into his first semester of freshman year, Swain and other students of Xavier University were notified that the school was being evacuated. "I was looking at flights, I was looking at trains, I was looking at everything," said Swain. "But luckily, I went to school with friends who were there with me at Xavier University. One of my friends had her car, which was ironic because she wasn't supposed to have a car as freshman." One broken rule led to a great escape. "I packed one suitcase and I hopped in her car," said Swain. "There was a total of four of us and we ended up driving to Tennessee. We waited it out and we saw that the levees broke." About 80 percent of New Orleans was underwater after the levees broke, according to dosomething.org. Hurricane Katrina caused nearly $81 billion in property damage across Louisiana and other states along the Gulf of Mexico. "A couple of days later I made the decision on if I was going to wait until Xavier opened back up, or was I going to go to Howard or Hampton" Swain continued. "And I decided to go to Hampton." Many students chose to transfer back to their respective institutions after the first semester of the 2005-06 school year. "I decided to stay [at Hampton] because my grandmother lived in North Carolina," Swain said. "Though I wanted to be away from home initially when I went off to college, I wanted security." Swain completed his freshman year at Hampton University. "My Hampton experience, for the most part, was unforgettable. I met a lot of friends; friends for a lifetime. That's something that I think that you can't really replace." 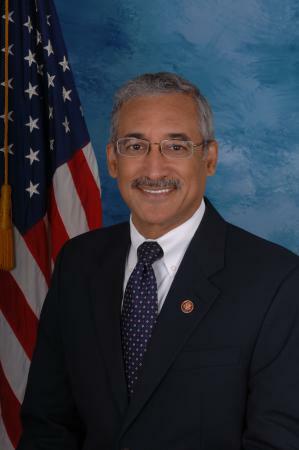 Swain graduated from Hampton University with a bachelor's degree in chemistry. He now works at the FDA center of medicine office of research in the division of applied veterinary research. Hampton University continued to provide assistance for the students displaced by Hurricane Katrina. The university hosted clothing and shoes drives, launched a relief fund, and welcomed Marvalene Hughes, president of Dillard University, as the speaker for the 63rd annual Opening Convocation. Friday, Sept. 18, Hampton University Pirates will go helmet to helmet with the Howard University Bison for the annual Battle of the Real HU football game. The venue is RFK Stadium in Washington, D.C. At 7:30 p.m. The only question that matters is how are you getting there? "I'm not sure how I'm getting there, said Nick Johnson, a senior finance major from Dallas, "but all I know is I'm going." Many of the Hampton faithful need to be in attendance as they play in Howard's home. Bison supporters young and old will probably be in support of dismembering Pirate pride. Many Hampton students from the D.C. area said they will be driving back home, packing up for the Megabus or stuffing into two-door convertibles with more pride than space for the weekend in order to show support. Alexa Hailes, a senior, business management major who prepared for her Friday drive, said, "This is my hometown, but you already know what it is: Hampton all day!" Meanwhile, the visiting Pirates are getting in the mind set to represent their Home by the Sea. Leon Shorter, a senior sports management major from Fort Pierce, Fla., said that they have played in the Bison stadium before and this is yet another opportunity to go out there show Howard just how real this HU is. "We aren't fazed," said Shorter, "this is what we do, we play and are ready to win." Blue Thunder and Hampton's Greek will be showing up and out as well. Quenton Jordan, a senior accounting major, from Chicago, said he will be driving his car to D.C. to stroll off with his line brothers representing Alpha Phi Alpha: "My LBs and I have confidence Hampton will rise to the occasion." Nya Harris, a senior strategic communication major from Washington, D.C., interned this summer with Events D.C. in the marketing and communication department and knows all about the hype of preparing for the game. The sports entertainment division was where Harris applied her public relations skills in handling the Nation's Football Classic accounts. "To get the opportunity to be a part of the chaos, I now understand all the work that goes into something like this," she said. "I am extremely excited to see the turnout." Student-athlete Shorter encouraged Hampton Nation to pump up the pride enough to fill the 45,000-seat RFK Stadium. 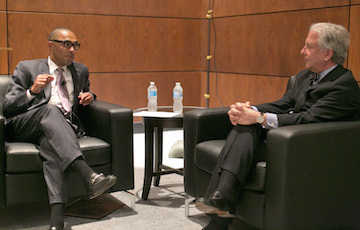 Matthew Winkler, former editor-in-chief of Bloomberg News, addressed a packed auditorium of Hampton University students Wednesday night. As engaged Scripps Howard School of Journalism and Communications majors took notes on smart phones or paper notebooks, Winkler sat with Dean Brett Pulley, who asked his former boss questions throughout the 90-minute meeting. Winkler said that many people in Bloomberg LP who worked in analysis, data collection, and sales knew what they were doing. Bloomberg in the 1980s and 1990s had "horsepower" because of the data that they possessed. Winkler placed much emphasis on the word "data" throughout the Q&A. He wanted the students to understand that Bloomberg was like the Internet before digital media went mainstream in the mid-1990s. When the floor was opened to student questions, sophomore Mike Rogers asked, "How does social media impact the way business news is discovered?" Winkler answered that much of what is tweeted is not news because it is not true. Their job as journalists, said the editor, was to show what is news and what is not. Sophomore Tyler Dixon asked what was the single most important thing he [Winkler] had done to get to where he is now and what advice he had for students who wanted to be successful? Winker answered, "Be prepared more than anything else. Luck begins with preparation and leads to opportunity." He also said that he had to "trust his instincts." "The more prepared you are, the luckier you are."